Here at Ableton HQ, we're on a mission to deliver free stuff to you, every Friday. What's more, we need the world to know just how diverse "free stuff" can be - it's Free Stuff for Everyone Friday, if you will. This week, we've got essential drum and effects sound for dance music, a Max for Live preset randomizer, and a sound design toolbox. Dig in! As the name implies, Niche Audio (a Loopmasters imprint) traffics in percussion, music, and effects samples that go for genres - from "Dubstep Supercharged" to "House Arrest". 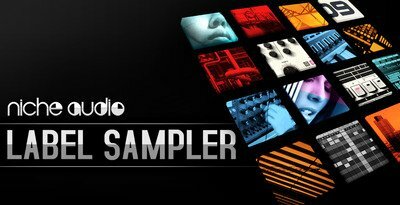 Now, you can grab a free set of sounds from Niche Audio - including one kit from each of their eight releases. Julien Bayle's ju.randomizer working its magic on Operator. Certified Trainer Julien Bayle is, to put it lightly, a bit of a Max-head - check out this feature to hear/see some of his inspiring audiovisual work. His latest free Max for Live device, "ju.randomizer", will randomize the parameters of any selected target device (instrument or effect) in Live. Plus, ju.randomizer will name your new preset for you - check out the screenshot above for "long-term amount", a randomly generated Operator preset. The results of ju.randomizer skew towards the experimental and inspiring - open up your instruments and effects to new possibilities! Last (but definitely not least) this week is a set of inspiring foley sounds, glitchy electronics, and other samples from 99Sounds and musician/sound designer Gavin Thibodeau aka Embra. In an interview with 99Sounds explaining the process behind this pack, Gavin reveals how tools such as Live factor into his work: "I guess my favorite thing about Ableton Live is its rack capabilities. Seriously, so many of my sounds, whether sampler or synth, are layered in the racks and I use the macro function a lot! Also, its easy re-sampling functionality for quickly bouncing down sounds and being able to further manipulate them is really useful." Grab Gavin's sounds for yourself from 99Sounds. As a famous cartoon pig once declared, that's all, folks! Come back next week - in the mean time, don't be shy about sharing your free stuff findings with us on Facebook, Twitter, and Google+, and don't forget to use #FreeStuffFriday.